Many quilters will tell you that they have one or two fabrics that they love way too much to use. These treasures are safely tucked away for safe-keeping, just like granny’s good china. Some of the fabrics in my Kiku Blossom Quilt are some that I’d been saving for best, and would still be tucked away if I hadn’t been inspired by a little book of Japanese blocks. Quilters have been making Dresden Plate blocks for many years. These blocks come in many combinations of petals (or blades), but this was the first time I had ever seen one with just eight petals. 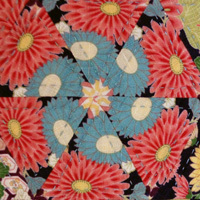 The block was called Kiku, which is Japanese for chrysanthemum. This made it the perfect match for my beloved fabric. The start of a quilt is just like any new romance. With stars in my eyes, and breathless anticipation, I designed and made the Chrysanthemum blocks, diligently basting each petal onto a paper template using the English Paper Piecing (EPP) method. I was in love with these plump, luscious petals. I appliqued them onto another one of my saved-for-best fabrics. My design incorporated a traditional block called Card Trick. 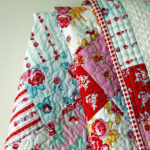 This block has been made by countless quilters, and is also a perennial favourite. I am almost too embarrassed to admit this, but the blue fabric was also one of my hidden treasures (okay, okay, my name is Helen and I am addicted to fabric). As with any new romance there was a glitch. I couldn’t find a background fabric that I was totally happy with. I settled on the gold floral, but had serious reservations. The relationship was on rocky ground. Being the trooper that I am, I persevered and made the quilt top, but it just wasn’t working for me. 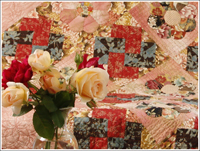 The stitching was fine, the design was fine, but the gold floral fabric just wasn’t working for me, so I did what many a good quilter does – I folded the top and put it onto the naughty-quilt pile. It was months later when my friend came across the quilt top and told me it was beautiful and to get it finished. Of course, as I always do as I am told, I carried on. 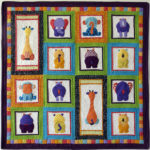 I added the border, basted the quilt, and spent many enjoyable months of hand quilting. With every stitch, love was beginning to blossom again. The gold floral fabric really did work. It made the other fabrics glow. 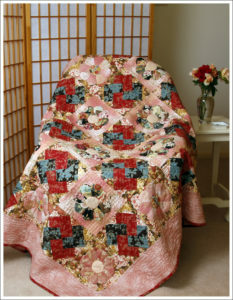 By the time I trimmed the quilt, and added the red binding, I was smitten. Quilts are like relationships. Sometimes it takes courage and endurance, but they are worth the love. The Kiku Blossom Quilt Pattern is available for you to purchase. 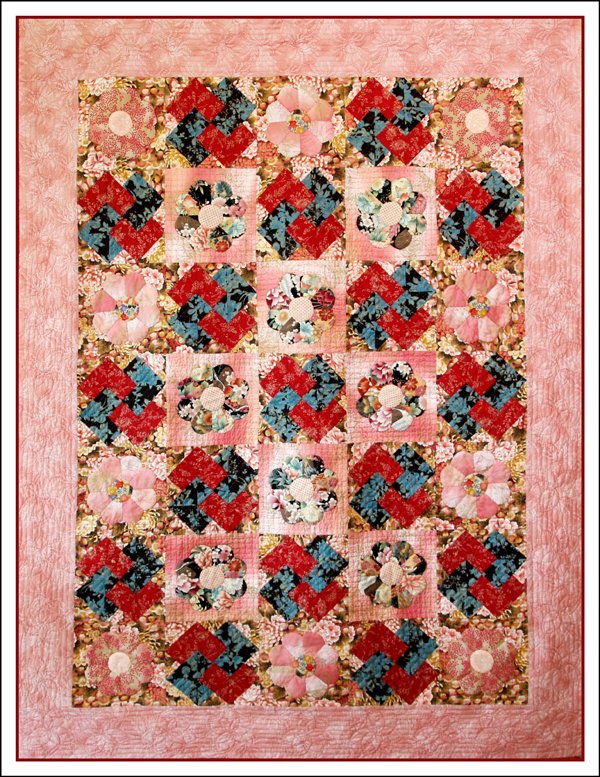 The pattern has the fabric requirements, the printable templates for the English Paper piecing, and has detailed instructions from start to finish. If you just want to make the Chrysanthemum Block, you can download the Free Block Template to trace.